Is putting your toddler in front of an educational video harmful or helpful? This is an important question for many parents, especially in homes where both parents work and taking care of young children can be hectic. Putting a child in front of a video is the closest things parents have to an off switch for their kids, so it can be very tempting to rely upon the distraction of an iPad or TV to keep their attention while you make dinner or attend to some other task. There is also a cottage industry of videos marketed to parents with very young children. Some are clearly nothing more than an entertaining distraction, like videos of other children playing with toys (which are incredibly popular). But parents can also be sold on the idea that their children are learning while being distracted, thereby alleviating any guilt from relying on the video-nanny. There has therefore been increasing research into the effectiveness of video learning for very young children (and older children and adults, but we’ll focus on young children for now). Here is a recent study of this topic which includes a great overview of prior research. Previous research has mostly shown that young children do not respond to video the same way they respond to a live person. Exposing toddlers to their native language or a foreign language through a video or just audio seems to have no benefit, compared to the identical content presented through a live person. The probable reason for this is that we are programmed from birth to be extremely social, and young children typically will pay great attention to other people – more than anything else. A video of a person, unfortunately, just doesn’t cut it. I encounter a range of opinions regarding the current state of politics and misinformation. At one extreme are those who argue for what I think is a false equivalence – politicians have always lied, the news has always been fake, there is nothing to see here. At the other end are those who argue that social media has changed everything. I think reality is somewhere in the middle. Lying politicians and biased journalism have existed as long as there have been politicians and journalism. But social media has fundamentally changed the dynamic, and we have yet to adapt to the new world we have created. This appears to primarily be a problem in societies that are based on open democracy. Ironically our freedoms have been weaponized against us. Russia interfering with the 2016 election is only the most obvious example, and is perhaps not the worst or most pernicious. While social media is a fantastic tool for communication and accessing information, it has some vulnerabilities. Traditional media had to build a brick-and-mortar infrastructure in order to have societal penetration, and that infrastructure was often built over years. This model favored, at least to an extent, quality control. If a news outlet was persistently wrong, or “tabloid” in its style, it was relegated to the supermarket checkout lane. 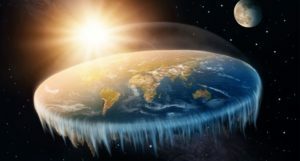 Whenever I write about flat-earthers, those who, incredibly, actually believe in the 21st century that the world is flat, there are multiple comments to the effect that we are just getting punked. No one really believes the world is flat, they are just saying that to wind us up, and we are taking the bait. But this view is demonstrably wrong. I have actually encountered flat-earthers out in the wild, so to speak – in meat space. They really do seriously entertain the theory that the earth is flat. Harry T Dyer also reports recently in Raw Story about a three day convention of flat-earthers. They weren’t tongue-in-cheek having a laugh. They were dead serious. I think the flat-earth deniers, if you will, are missing the point. They are approaching the issue like most people do initially – looking at the claims from a scientific point of view. From that angle the claims of flat-earthers are beyond absurd. They are so extremely ignorant and illogical that it seems reasonable to consider that either there is some psychological pathology involved, or it’s just a hoax. There is no doubt that the belief that the earth is flat is rooted in a profound scientific illiteracy. It is not only ignorant of the findings of science, but also of the history of science, and any knowledge of the institutions of science and the participation of countless students and citizen scientists. But flat-eartherism is not about scientific illiteracy – meaning it is not merely a manifestation of profound ignorance of science (which is also why it cannot be corrected with scientific information). As Dyer also points out, belief in a flat earth is ultimately about rejecting institutional knowledge itself. Three weeks ago I wrote about a recent survey of attitudes on college campuses regarding free speech. I and many other bloggers used the new data as an opportunity to make a few skeptical points. First, the data does not support the popular narrative that there is a free speech “crisis” on college campuses. The long term trends show that support for free speech is increasing, and that college education and being liberal both correlate with more support for free speech. These trends directly contradict the standard narrative that liberal college professors have “run amok” with their political correctness. In response Sean Stevens and Jonathan Haidt wrote a couple of articles arguing that the skeptics were wrong on this issue. To be as fair as possible, I do think they have one small point to make, but overall I think they are tilting at a straw man of their own making. I also think they are making the exact kind of errors of biased interpretation that they are accusing the skeptics of making. The legitimate point they make is that while the long term trends are positive toward free speech, recent data suggests that the current generation (iGen) entering college may be reversing that trend. At least, we should consider this recent data in formulating any opinions about the current state of affairs. I have always considered myself an environmentalist, but never found common cause with the environmentalist movement. The problem was (and remains) that so much of the environmentalist movement seems to be at odds with science. Not always, of course. When the science agrees with a pro-environmentalist position, like the consensus on human-caused global warming, then environmentalists happily cite the science and link arm-in-arm with scientists. However, when the science does not align with the environmentalist position, such as with farming practices, GMOs, and nuclear energy, they just as happily take an anti-scientific position. Then scientists are in the pocket of big industry, the science cannot be trusted, and they cherry pick only the science they like. So I like to think of myself as a science-based environmentalist. Even if you set aside the moral dimension and take a purely selfish point of view (I don’t, but even if you do), who wants to live on a planet that is all concrete and farmland? I love nature and wildlife, and I think most people do. Nature makes people happy. No one wants to live on a polluted planet either. Pollution lowers quality of life and causes substantial health problems and cost. On January 13 a state-wide alarm was sent out in Hawaii warning of an incoming missile. “BALLISTIC MISSILE THREAT INBOUND TO HAWAII. SEEK IMMEDIATE SHELTER. THIS IS NOT A DRILL,” the emergency alert read. For the next 38 minutes the citizens of Hawaii had the reasonable belief that they were about to die, especially given the recent political face off with North Korea over their nuclear missiles.